I went into Cambridge last Thursday and couldn't help but pop into The Body Shop! I have a slight obsession with the smell of tea tree so this range immediately jumped out at me. They had so much variety in the range, from facial washes to shower gels. From the range I purchased this body wash (£6.00) and a Tea Tree Concealer (£7.00), the concealer I'll be reviewing in another post! This body wash is incredible! I've been using the Superdrug Tea Tree range for about a year now and it's worked quite well, but I wasn't completely satisfied. By 'worked well', I mean it has made my skin look a whole lot clearer by reducing spots. That's right, the dreaded spots! Although I don't get many at all, I often have bad breakouts on my back around this time of year. Even though they tend to disappear by about the middle of summer, having to keep my back covered in the hot weather because I'm embarrassed of the appearance is not fun! The Superdrug Tea Tree range worked, but not quickly or effectively enough. Now that I have a job, I've been getting a bit more money to spend so I decided to purchase this product. Although it's not expensive, I was hesitant to buy it because there are so many cheaper products with similar ingredients. However, this was definitely worth it! I've had the product only 1 week and I can already tell a huge difference in my skin! Not only have the number of spots been reducing but it's nearly all cleared up. Another week and I predict that I'll be confident enough to wear backless dresses and bralets! This product has honestly been my saviour and is definitely worth the price. There's also a lot of product in the 250ml bottle which should last quite a while - maybe about a couple of months, compared to the Superdrug Tea Tree washes which usually last me about a week. I would recommend this product to anyone looking for a good natural body wash, especially if you're looking to clear up your skin! I hope this has been helpful! Let me know if you've tried this body wash or any others that you think are well worth a try! 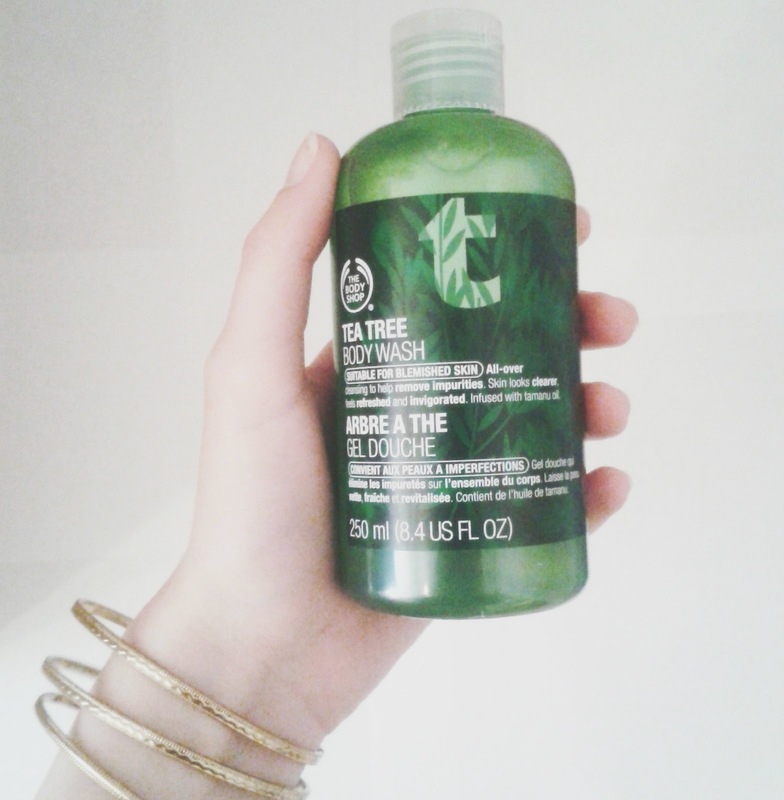 I love the Body Shop products, especially the cleansing oil!